But it wasn't one dream! By now you know that many people are angry that the Oscars snubbed Selma. The film is up for Best Picture, but odds are long given that director Ana DuVernay wasn't nominated. Nor were any of the actors–Selma's only other nomination is for Best Original Song (John Legend and Common, "Glory"). Oscar's timing looks so insensitive in the aftermath of the Michael Brown and Eric Garner slayings that cynics have questioned whether the white folks who control Hollywood have turned their backs on Dr. Martin Luther King's legacy. But what if Oscar got it right? Selma-the story of the historic 1965 civil rights march from Selma to Montgomery, Alabama–is simply one of the most important chapters in the battle for racial justice in American history. Three attempts at the simple act of crossing the Pettus Bridge into Selma ultimately cost three lives, sent dozens to the hospital, and resulted in hundreds of arrests. You can be forgiven for inferring from the film that the toll was even higher–the reality was bad enough and shocked the collective conscience of a nation. Selma was the reason that President Johnson reluctantly advanced the 1965 Voting Rights Act. My take on Selma is that it's an important and inspiring cinematic experience wrapped in a good movie, though not a great one. Pay attention to the opening and closing sequences of the film, as they are, by far, the most innovative pieces of filmmaking on display. Everything else is perfectly competent, but hardly path breaking. It's very hard to make a movie about events in living memory. Audience members come into the theater armed with images of events and principals that have been chiseled into their brains by personal experience, teachers, or by endless viewings of archival footage available on YouTube. (Is there a student over the age of 12 who has not viewed a Martin Luther King speech? If so, that child's social studies teachers should be fired!) Try as one will, it's difficult to avoid comparing actors on the screen to what we think their real-life counterparts looked and acted like. 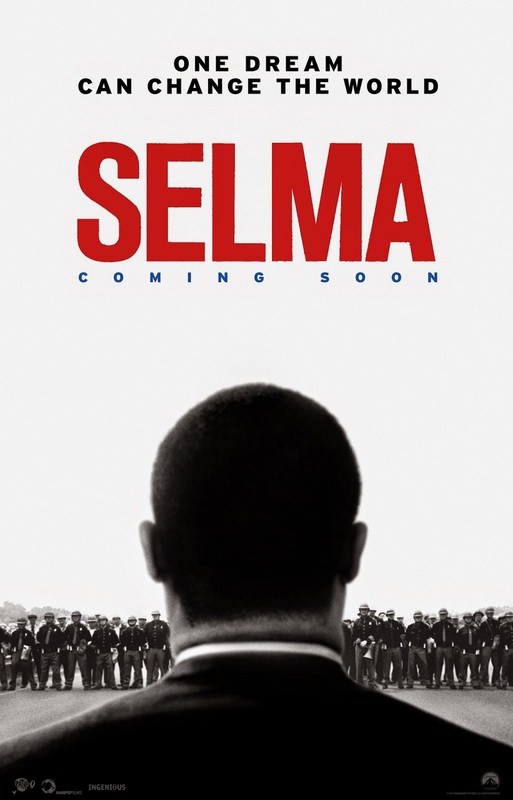 The first third of Selma is rather slow-paced, as if DuVernay wanted to give us time to imagine David Oyelowo as Dr. Martin Luther King, Jr., Tom Wilkinson as President Lyndon Johnson, Tim Roth as Governor George Wallace, Dylan Baker as FBI director J. Edgar Hoover, and Oprah Winfrey as frustrated black voter registrant Annie Lee Cooper. If that was DuVernay's goal, two problems emerge. First, it doesn't negate the pacing problem and, second, the actors don't succeed in making the audience suspend disbelief. Oyelowo delivers a mixed performance, but at least we think of him as Dr. King. That's simply not true of Wilkinson, Roth, Baker, or Winfrey; Wilkinson is too controlled for LBJ, Roth not intransigent enough for Wallace, Baker not evil enough for Hoover, and Winfrey not determined enough for Cooper. If I had to pick one performance that was snubbed, it would be that of Carmen Ejogo as Coretta Scott King. She not only looks like young Coretta, but also plays her with the articulation, steely resolve, and simmering sense of personal and social injustice that anyone who ever heard her speak will recognize. Also noteworthy is the acting of Stephan James as John Lewis–the SNCC leader who came to see tactics as more important than turf wars. DuVernay also did well in choosing secondary actors that looked similar to the people they portrayed: Bayard Rustin (Ruben Santiago-Hudson), Andrew Young (Andre Holland), Father James Reeb (Jeremy Strong)…. It makes one wonder if she might have been better off staying away from actors with recognizable faces. But let's cut to the chase: The reason why DuVernay and Oyelowo aren't in the Oscar chase is there isn't anything particularly distinguished in their craft. The story is told straightforwardly and sequentially. But here's also a problem–by focusing so tightly on Dr. King, DuVernay gives us more hagiography than history. Oyelowo plays King as a saint–a man always able to divert his personal outrage into moral outrage. Such a view confuses the private man with the public rhetorician, just as the ambiguity over whether he had cheated on Coretta is out of accord with the objective reality that he did. Maybe some people need heroes as pure as the driven snow, but I don't believe in saints. If I can be so bold, DuVernay gives us a Hollywood Martin Luther King, an unsettling mix of blandness, fieriness, and Buddha-like serenity. Mostly Oyelowo's is a version of Chekov's gun–the pivot around which all action must center. It does nothing to diminish King's honor to say that King was the public symbol of the Selma, but that locals (Annie Cooper, Amelia Boynton), SNCC (James Foreman, Stokely Carmichael), and SCLC operatives such as Diane Nash and Hosea Williams did most of the nuts-and-bolts work. Did Oscar get it Right to Snub Selma Director?